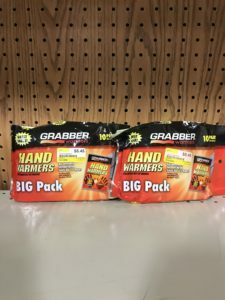 Keep your hands warm this winter with the Grabber Hand Warmers now available at Argyle Feed Store. These hand warmers are great for those freezing cold football games and tailgating parties that are fun but not fun for your hands. This warmer lasts for 7 hours or more and there is no shaking or kneading involved. It’s easy just place the warmer in your glove or coat pocket and you’ll be toasty in no time. Measurements: 2 x 3.5 in. This entry was posted on Thursday, December 21st, 2017 at 4:24 pm	and is filed under News & Updates. You can follow any responses to this entry through the RSS 2.0 feed. Both comments and pings are currently closed.